In 1957 Picasso did fifty-eight paintings related to "Las Meninas" by Velazquez. Picasso did this because he believed that he belonged in the company of one of the major art historical figures of all time. Forty-four years later I have made a new series of paintings based on several of Picasso's paintings because I'm determined to be in his company. 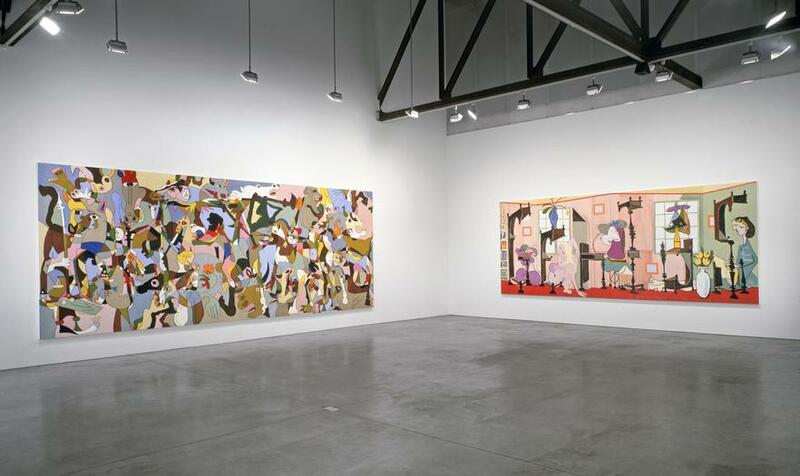 The centerpiece of the exhibition is a large scale painting [8.5' x 25'] titled "War and Peace" utilizing imagery from four of Picasso's epic paintings: "Guernica"; "La Guerre"; "La Paix"; and "La Joie de Vivre" as a structure for the work which is filled with all of the animal imagery Landers could find in Picasso's paintings, sculptures, and sketches. Landers piles the images on top of each other to create a web of tangled shapes in bright colors which are reminiscent of Landers' own stripe paintings, Picabia paintings, caricature paintings, as well as his use of the color-filling technique he uses in Adobe Photoshop for his magazine work. In two other large-scale paintings titled "Sean" and "Genius" Landers restructures motifs from "Femme au bouquet", a painting of a woman with a vase of flowers and "Femme au buffet", a painting depicting a woman sitting at a desk, to spell out the words "Sean" and "Genius", respectively. Landers' intentions range from humor, audacity, and ego as a means to create structure. One of the things that is so astounding about these paintings by Landers is that no matter how well you think you know Picasso, it is difficult to distinguish what might be directly taken from Picasso and what is purely Landers.